Sometimes I wonder whether the world has gone crazy. The latest ideas from the FIA do not help to make me think otherwise; Mighty Max is giving a very good impression of a man so divorced from reality that he has begun to utter gibberish. It seems that he is so determined to introduce a standard chassis into F1 that, if the manufacturers don't agree, he will rescind the ban on movable aerodynamic devices. At the same time, he gives his usual lip service to "improving the show" but it never occurs to him that it is the aerodynamics that have spoiled the show in the first place. Effectively, he is saying that, unless everyone agrees to his vision of the future, he will destroy the sport for everyone. What is so bad about the idea of a standard chassis anyway? Most open-wheel formulae have gone that route and, as Max says, the cars are almost identical in looks already, if you take away the differing color schemes. But that is hardly a fair argument when he was the one who so constrained the rules that the wind tunnels give the same answers to everyone. Yes, the cars are almost standardized already, thanks to the detailed specifications in the rule book, but no, that is not justification for stifling what little creativity remains to the designers; it is more a strong argument for freeing up the rules. 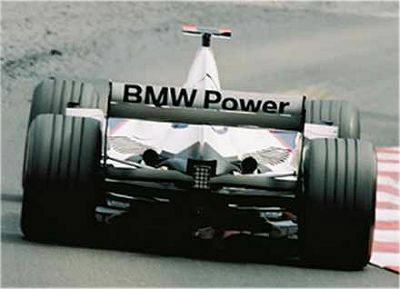 And the fact that most formulae use standard chassis now is actually a very good reason why F1 should not follow the herd; if the sport wants to continue to be regarded as the pinnacle of motor sport, it has to be different and allow the designers to compete. Max really should do his homework and find out why the manufacturers are against the idea of a standard chassis. They are in the sport purely for the marketing benefits of winning and so the leaders want to retain the advantage they have built and those lower down the order want as many opportunities as possible to get to the front. The standard chassis will limit their chances of getting the jump on their rivals and will also tempt the market to regard F1 as just an engine development facility. Manufacturers need to be able to point at their car and say, "See? We build a better car than anyone else." And that means the whole car, not just the engine, or they could save themselves an awful lot of trouble by just being engine suppliers, rather as Cosworth used to do. Huh? Just a moment, Max, was it not manufacturer teams that were devising ways around the ban so that you were forced to outlaw flexi-wings? Explain to me why the same teams should be so frightened by the very idea of movable aero devices that they cave in on the subject of a standard chassis. Do you think the costs involved in developing such things would scare them? Yet it was only recently that you admitted that all your measures to try to bring down costs have merely resulted in teams spending the money elsewhere. The fact is that they are not interested in saving money as long as they can get to that top step of the podium and sell a few more road cars. Wake up and live in the real world, Max! What is the most frustrating thing about the continuing saga of Max's brave new world is that the answers are obvious and offered by any number of F1 enthusiasts. You want to reduce costs and improve the show? Then decrease the influence of aerodynamics. How that could be done is open to some debate but even I could make a few simple suggestions - the flat bottom extended to the nose, for instance, and a ban on wings. The point is that we know now that aerodynamics can glue a car to the road but that is hardly relevant to road cars; you can stick a highly ineffective spoiler on the tail of your runabout but forget wings and winglets, they're just not practical. The science of aerodynamics has created F1 cars that cannot run in each other's wake and so passing has become almost impossible. Why is it so difficult to see that aero needs to go? Note also that the FIA hasn't even pretended to listen to the fans this year. Surely the solution to the fans feeling ignored by the way the questionnaires were done in 2005 and 2006 was to make a [em]better[/em] questionnaire, not to withdraw it? The "agree with me or I'll do something that totally contradicts my stated intentions without changing my rhetoric" move here is exactly the same in nature. Max has forgotten what his role is in F1 - to ensure that the sport is preserved and improved by whatever rules are necessary (and only those that are necessary). This is a good demonstration why a clearer thinker than Max needs to be at the helm. I don't think they dared issue a questionnaire this year - they would have had too many answers they didn't want to hear. Even using the previous technique (of not asking the right questions), the message would come through that the fans hate what the FIA and Max are doing to F1. It becomes clearer every day that Max is taking F1 down a very strange road indeed and yet there seems to be no way of stopping him or even making him listen to our doubts. Surely there is something wrong with a system that allows such a situation to occur so often (remembering the Jean-Marie Balestre tenure before Max's)? How about an alternate-term system for FIA presidents? They could be permitted five-year terms (or less if the president requested - Max Mosely's first term was a one-year self-requested probation), but then have to do something completely outside the FIA organisation for the duration of the next five-year term. If the president does well in office, that president may be re-elected for the term after that for another five years (subject to the usual checks and balances), and so on. It would remove the incentive to govern in a way that takes power for granted (since someone else may easily remove the power from the president), encourage democracy and still allow for long-term planning. If this is not sufficient, a maximum number of terms (like with USA presidents) could also be added. There could be a problem with presidents and vice-presidents creating a power lock between them, but if that wrinkle could be sorted, I think this method of preventing power-craziness could be solved. I agree that a different term for FIA president would be best, and I like your suggestion, Alianora. Anything that limits the amount of damage that one man can do has got to be good!